This module describes hydrography pertaining to nautical charting and navigation. It covers how nautical charts are created, who creates them, the products available, and how to find and use them. The content and presentation were good, but the lesson crashed repeatedly- over a dozen times. Course covers the basics but a little more in depth training with more examples of the concepts would be a help. Really helps to have any kind of a background in this before taking the lesson. Helps to understand all the acronyms and other information not formally described in the lesson. Very helpful for my job. It also has a nice inteface which is good for learning. Kudos! It was easy to understand even if you are a beginner in this field. Great course, I especially liked the history and agencies/offices portion of the course. Downloaded material was not intuitive for use. I felt this lesson was very good, it gave me some historical reference and it also provided me with knowledge of nautical charts and publications. indicar que la tecnología avanza a pasos agigantados y en poco lapso ya existiran otros metos que cualquier operario podra utilizar en la hirografia. Parts of this lesson were challenging to me only because it is somewhat out of the realm of my studies and interest, which is meteorology. As a new person to this type of work, this course is very useful in providing an overall picture of the value in generating data by survey to providing meaningful information to the public with the various types of maps/charts. I enjoyed the interactive aspects of this course. I would recommend more questions per section. Give more clues as to what information to retain when given so much data. 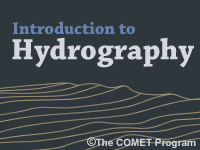 Good lesson, it has a little more emphasis on charts than hydro collection. But it does give an overview of what goes into collection and how that varies from regular bathy collection. I also enjoyed the history behind the science. I would say this is a good lesson to take if you are interested in learning an overview of what hydro is. Very cool! Need a more detailed course soon. Explain the general operating principles, advantages, and limitations of a multibeam echosounder.